I would much rather be out in nature or travelling than stuck in front of a computer. 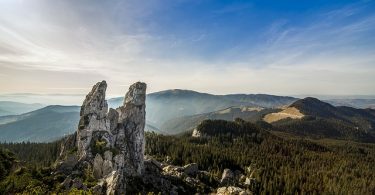 But, we regularly find ourselves spending time on quite a few sites that we think are pushing inspiring ideas, and general good advice on camping, hiking, travel and other adventures. Without further ado, here are what I think are the top outdoors, adventure and travel related blogs to keep an eye on. I gathered 20, then 30 and before I knew it I had 48 – all very inspiring to me and must follows. AppalachianTrials.com was originally created to inform aspiring thru-hikers and their loved ones about Appalachian Trials (i.e. the book). He still hope to do this, but the book is now a secondary mission. Today AppalachianTrials.com hopes to accomplish so much more, and having been recognized as the Top Hiking and Outdoor Blog by USA TODAY. David has just returned from a great trip in Montreal and he’s heading to Paris next. On his blog he shares insider info on his travels. Mark is a outdoor enthusiast, his love for Alpine and Nordic skiing could inspire anyone to start this exciting sport. There is plenty of useful information on his blog from health tips, fitness tips and nutritional tips. Your destination for information and stories on travel, adventure and the outdoors. From tried and true travel tips, to the latest and most innovative products on the market. Lyn is a cyclist in France. Her blog covers everything from route suggestions and cycling accommodation ideas to advice for vegetarian cyclists. She blog about her adventures cycling, sometimes with her two mini cyclists and her husband, sometimes on her own. Lyn’s blog is also listed on the Top 50 Bicycle Touring Blogs, as well as the 2016 Top Outdoor Adventure Blogger Award. Here’s another one, Lyn! Leigh McAdam is the founder and main voice behind HikeBikeTravel. She long ago abandoned a career as a geologist, dietitian and hands-on owner of a successful small business to follow her passion for travel, adventure and the outdoors. Along the way, she developed a love of photography and now she hates to go anywhere without a camera. Leigh has been recognized internationally in magazines, television and radio. She is a member of the Professional Travel Bloggers Association (PBTA), the Travel Media Association of Canada (TMAC) and the Society of American Travel Writers (SATW). If your looking for the inspiration you need to finally get of your couch then this blog might just do it. Vern’s trip reports and images will inspire you to push your own physical limits. It’s certainly inspiring us to get out more! We too have that feeling of belonging whilst being in the outdoors. Jeff and his family all being lovers of the outdoors, can be an inspiration to many. His blog is very informative and definitely worth the read. Michael Lanza is the creator of The Big Outside blog. 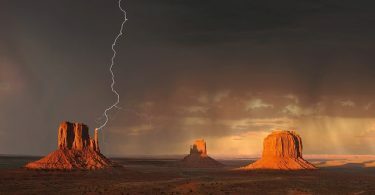 He is a writer, outdoor photographer, author, and speaker. A longtime hiker, backpacker, climber, backcountry skier, trail runner, paddler, and cyclist. He started The Big Outside with a simple mission: to offer stories, photos, and expert trip-planning advice on America’s and the world’s best outdoor adventures—including many that are great for families. Most importantly, these stories are based on his on-the-ground, first-hand knowledge from having done all of the trips himself. Meanderthals: A Hiking Blog is a series of trail reports for many of the best hikes in Western North Carolina. Jeff is fortunate to live in this beautiful environment – the “Land of Waterfalls,” and have the opportunity to day hike every week. The Blue Ridge Mountains in Pisgah National Forest rise as high as 6,600 feet, and are filled with conifer and hardwood forests, some super old. The mountain laurel and rhododendron are plentiful, and the region fully enjoys all four seasons. Most posts on this blog will be about hikes available in this area. So, load your pack and join him. Sabrina, her wittiness and humor definitely seperates her from other bloggers. Her writing style is so unique how could you not be drawn into her adventures. Go ahead just read her about me and tell us you not hooked, we dare you! Annette is the author of the book Bucket List Adventures, owner of the restaurant Sugo Trattoria in Northern California, a serial adventurer and creator of this award winning travel blog, Bucket List Journey. Phew! That’s a mouthful. As an obsessed new experience collector, her passion is for checking the world off her bucket list one adventure at a time. 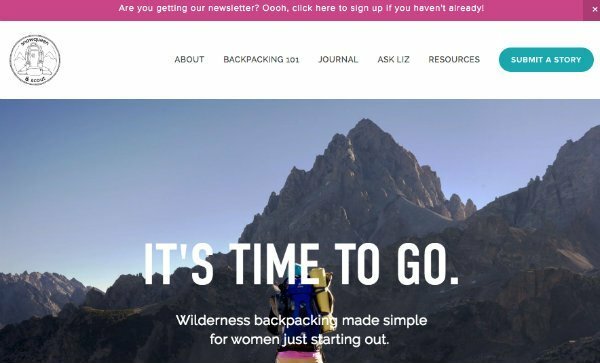 In 2015, Liz decided to dedicate herself to sharing what she have learned about backpacking because she believes every woman who wants to try it, should. She believes a backpacking adventure is one of the most important journeys you’ll ever take. She wants to help you experience that. We’re in! Karen Ung is married to her backpacking sweetheart and is a mother and lover of maps, mountains, and mochas. With her Geography degree and experience leading hikes and backpacking trips in the Rockies, she is full of ideas on where to go and what to do. 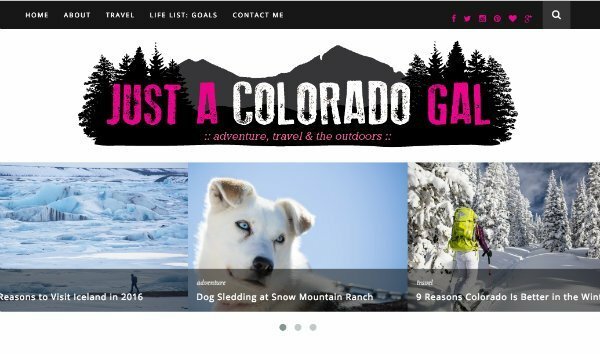 The mission of her blog, Play Outside Guide, is to provide “everything families need to know to get outside and have fun. Heather thinks we all need to spend more time finding adventure: running on trails, sleeping in tents, exploring the open road, climbing big peaks, and traipsing about foreign countries. To that end, she’s trying her best: she’s cycled her road bike across the United States, lived in a tent for four months, honeymooned in a van, climbed 45+ peaks of 14,000 feet or higher, and pack-rafted the Alatna after being dropped in the middle-of-freaking nowhere by an Alaskan bush pilot. She lived on three continents and traveled to 27 (and counting…) countries. The Active Times aims to be the world’s best source of authoritative, inspiring, enlightening content for living the active, adventurous life. They’re passionate about great gear, expert technique, interesting people, and amazing venues close to home and around the world. They bring them all together—and connect the community—in a smart, visual, accessible way. Good One! Derek is a happy father and husband. He is a typical guy, not an athlete or someone with an extensive amount of time off. He works his outdoor adventures into an otherwise busy life with family and work obligations. He’s just put hiking and the outdoors high on his priority list of things to do when he have a chance. Couldn’t agree more! On this blog, Emelie chronicles the triumphs and pitfalls of parenting high-energy children while teaching full time, writing, training for marathons or triathlons, trying to put healthy meals on the table, and breathing deeply through life’s adversities. She believe in the power of home, good food, fresh air, challenging goals, and the stories that weave these all together. Tiffany is a Campy Mom. She is a part-time Respiratory Therapist and a full-time stay-at-home Mom. She has a wonderful husband and kids. She’s always enjoyed the outdoors, whether it’s camping, fishing or just being outside.Her blog focuses on all aspects of family camping- from pitching tents to dealing with family in a confined space. You will find reviews of the latest, greatest and oddest camping gear, camping recipes, good deals and camping tips – do check it out! Melissa is the founder of Adventure Tykes. She is also a mom, wife, avid runner, hiker, outdoor enthusiast and amateur chef. She live in southwestern Utah with her husband, son and two pigs, Bierstadt and Petunia. (Awesome!) She had this grand idea to share information with parents on how to get into the outdoors or back into the outdoors once they had kids. Love it! Debbie founded Odyssey Outdoors with the goal of helping everyday families develop positive, healthy ways of interacting through the fun and challenge of outdoor adventure. Childhood is precious and there is much magic-making to be had outdoors. Life for everyone is so busy these days, between career, kid activities and making everything work but Debbie does a grand job of juggling it all! Lisa have a thing for cupcakes! She was born and raised in Norwalk, Connecticut. At a pretty young age, she started running local 5k races and her love of running continued while she attended Brien McMahon High School. Running was always an escape and looking back, running really helped her through some difficult times during that phase of her life. Moi is a Canadian-born mom of two, former Denver Post columnist, family travel writer, and editor of MileHighMamas.com and 9News contributor. Expert on all things Utah, Denver, family and travel. We love her adventures. Anne started running consistently in September 2009, approximately 4 weeks after her little one was born. Her goal at that time was running to lose weight. At some point along the way, she fell in love with running and found herself. Her blog highlights her journey in to running and doing her first marathon! Congrats! This blog is run by Meg and Mike, self proclaiming Adrenalin junkies, and incredibly active travellers, they’re bringing us adventure travel from all over the globe! From mountain biking “death road”, Bolivia, to skydiving over the Swiss Alps; bungee jumping in Costa Rica, boarding the world’s largest sand dunes, and summiting Mt Kilimanjaro; there is no mountain too high, and no fete too extreme for these two. Inspiring! Amanda is just an ordinary Midwestern girl trying to balance a “normal” life with a desire to discover the world. She’s here to prove to people that traveling (and especially traveling as a woman) doesn’t have to be scary, lonely, or out of anybody’s reach. Breathedreamgo offers inspiration, insight and advice for people who want to experience authentic, adventurous and meaningful travel. Breathedreamgo was founded by Canadian travel writer Mariellen Ward. Check it out – we dig it much! When he is old and decrepit many years from now, Adonis will have this blog to take him back to better days. Sure, he enjoy the occasional trek to the museum (it’s good for the brain we hear) but he’s all about trekking to the base of a mountain or pitching a tent in a secluded beach so he can witness a glorious sunset and share it with US. YES! Jennifer and Tim and were professional travel writers who love adventure and wine, so they often try to combine the two. 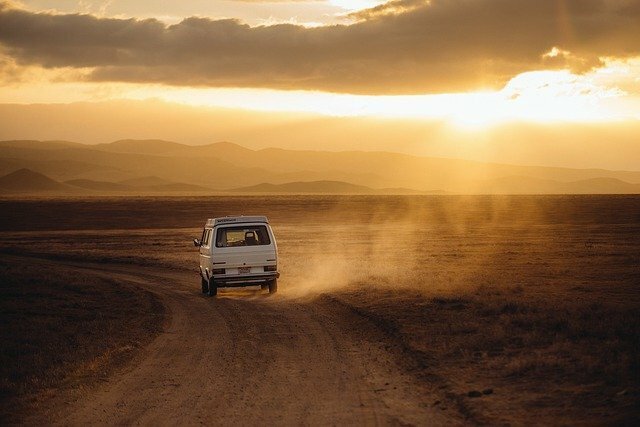 If you’re looking for a travel blog about a long-term around-the-world journey, how to travel on $50 a day or less or traveling with kids, Luxe Adventure Traveler isn’t it. If you’re thinking you’ve stumbled upon a website dedicated to slow ocean voyages and ports of call around the world, Dan and Casey are sorry to let you down. This couple might occasionally go on cruises, but they rarely talk about them here. It’s all go with these 2! Erin is the founder and senior writer of this blog. Open-ended travel sounds like a dream come true. So why does she do it? The family love new experiences and seeing more of this wonderful world with their kids. Yes folks, having kids does not mean settling down – go see the world! 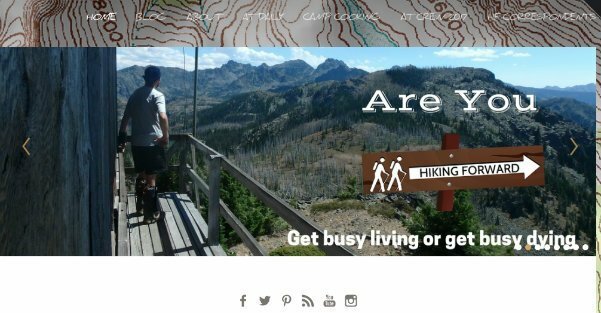 Bearfoot Theory is the outdoor adventure blog for the everyday explorer (Yup, you and me). If you love to travel and spend time outside, you’ve come to the right place. Kristen is here to inspire you to get out there and to help you plan your next adventure. The folks at Carpe Travel work to inspire real folk like us to explore their wanderlust; to seize the day. To seize that next adventure be it backpacking into Machu Picchu, car camping with your kids or sipping wine in Italy. We’re not waiting to see the world “someday”, because someday may never happen, but today we will. Yes we will! Amber is a recovering tax attorney from the largest law firm in the world. Now she is a professional travel blogger, digital nomad, and professional eater, traveling With Husband In Tow. Together, Amber and Eric travel the world in search of new Adventures in Food, Wine & Luxury Travel. Victoria is a semi-nomadic writer, editor and cake addict based in London with her filmmaker husband, Steve. This blog is about her journey to work out what the hell she should do with her life. Travel, yoga, digital nomadism, plant medicines, mindfulness, healers, start-ups, humanitarianism and hedonism – She tried it all, an open-minded skeptic. She is a travel geek with a taste for all things whimsical. This blog is filled with her best travel tips. 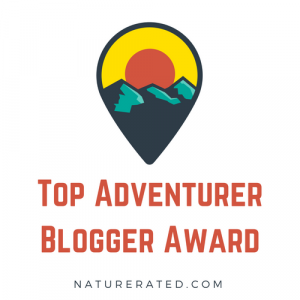 Ordinary Traveler is an award-winning adventure travel and lifestyle blog, written by Christy Woodrow and Scott Calafiore. In 2009, Christy and Scott created Ordinary Traveler to chronicle their travels and share their love of photography. Over the past 6 years, their little blog has grown tremendously and is now one of the top travel blogs, offering useful travel advice and tips on balancing a home life with extreme wanderlust. Flying the Nest is a travel blog run by Stephen & Jess, a young Australian couple with a passion for travelling, photography and film making. They began blogging in September 2014 as a way of documenting their adventures together. Laura and Tanbay, a young Anglo-Germanic couple who have been luxuriously travelling the world for the past 3 years. They specialize in adventure couple travel with an emphasis on luxury travel. Be it through house sitting or staying in the area’s most prestigious hotels, Their need for luxury is only matched by their thirst for adventure. Grantourismo is a blog written by Lara and Terence where they share stories about their travels, the places they settle into and the people they meet along the way. They see it as somewhere you can come to be inspired to travel, to gain insight and information to plan your trips, and to find the tools to book your own meaningful and memorable experiences. Jessica and Laurence are a young couple blogging about their travels around the world. They only write about places they have visited and the products they’ve actually tried. I really enjoyed the top 10 things to do in Panama post – it’s next on my bucketlist. A Crafty Chai blog is pretty much Cathy’s little corner of the world! It covers things she passionate about: crafting, eating, drinking, exploring, creating and most of all, her beautiful little pooch, Poppy. Mat, Lora and Cedric, live in the inner city around South East London.Through this blog, they’re exploring their thoughts on bringing up Cedric, education, adventures and life in general. Geeky Explorer is a platform to aggregate all Bruno’s travel tips and advice on the destinations he go and share it with the world. Who knows how many robberies his safety tips avoided in Rio de Janeiro or how many hours of planning his guide for island hopping Thailand spared? So that’s it – what do you think about this massive list? Have I missed any?